Here's some pics of the Big Dig. Those of you familiar with our Rocky River store will be glad to know that this project not only is about the expansion of our basement storage, but the Big Dig will also bring about the end of the Great Depression! That's right, the previously "sometimes-hard-to-navigate" rear parking lot area, with it's sloping dip towards the building, will be improved as well. The project is really moving along. 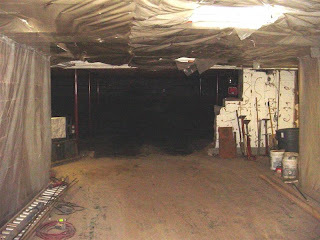 As you can see, they've busted into the basement from outside and have cleared out the old crawl space. They are getting ready to pour the new concrete floor. Next episode: "Let there be Light!"